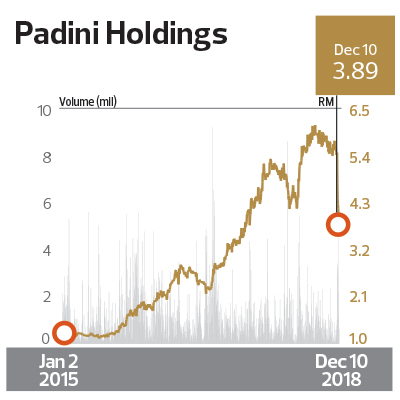 "HIGHEST RETURNS TO SHAREHOLDERS OVER THREE YEARS: CONSUMER PRODUCTS & SERVICES: Padini Holdings Bhd - Expanding Its Presence In Asia | The Edge Billion Ringgit Club 2018"
Fashion retailer Padini Holdings Bhd was outperforming its peers before its shares tumbled recently. The counter grew more than fivefold to RM5.91 on June 29, 2018, from RM1.16 on June 30, 2015, bringing its market capitalisation to almost RM4 billion. This represented an impressive 73% compound annual growth rate (CAGR) in the award evaluation period. It is worth noting that its market capitalisation soared from RM875 million on June 30, 2015, to RM3.93 billion on June 29, 2018. It expanded further to RM4.08 billion when the counter touched RM6.13 on Aug 6 after the company announced a stellar 45% year-on-year growth in net profit in its fourth financial quarter ended June 30. Net profit attributable to owners grew at a three-year CAGR of 20.07% to RM157.39 million in its financial year ended June 30, 2017 (FY2017), from RM90.91 million in FY2014. Revenue increased at a three-year CAGR of 21.94% to RM1.57 billion in FY2017 from RM866.26 million in FY2014. For the full year of FY2018, net profit grew 13.26% from RM157.39 million a year ago to RM178.26 million while revenue was up 6.88% to RM1.68 billion against RM1.57 billion in FY2017. While the board has no intention of implementing a fixed dividend policy, the group paid out at least 40% of its earnings as dividends for at least six years. In its 2018 annual report, chairman Chia Swee Yuen attributed the higher earnings to “continuing top-line growth and better supply chain and product management whilst continuing to offer customers value-for-money products”. While domestic operations are still the driver of revenue and profit, Chia said the group will continue its foray into overseas markets with its own outlets instead of relying on franchisees. Having established a presence in Cambodia in FY2018, Chia said Padini will expand further in Asia by establishing a presence in Thailand. The release of the company’s earnings for its first quarter ended Sept 30, 2018 (1QFY2019), on Nov 29, however, sparked a sell-off of the stock. From its close of RM5.52 on Nov 29, the stock skidded nearly 30% in seven trading days to its lowest level in over a year of RM3.89 on Dec 10. If measured against its recent high of RM6.13 on Aug 6, some RM1.5 billion of the company’s market capitalisation was wiped out. At the time of writing, only Macquarie Research, which had initiated coverage with a RM8.05 target price on June 28 this year, had a “buy” recommendation on Padini. Its price target was the highest on the street at RM6.05, well above the 12-month consensus of RM4.89 and the most bearish target price of RM3.95. Five other research houses had a “hold” call while as many as six called a “sell” on Padini, according to Bloomberg data at the time of writing. This reflected the downgrades and downward earnings revisions after the company’s 1QFY2019 earnings came in well below consensus expectation on lower-than-expected sales and margins. Moving forward, Kenanga Research expects the earnings momentum to be limited by higher costs from the new Sales and Service Tax (SST), the gestation period for its Cambodian and Thailand operations, which are expected to incur higher start-up costs than Malaysian operations, and the ringgit’s weakening against major currencies, such as the US dollar and yuan. Padini has indicated that it will absorb the SST cost to help maintain demand for its affordable product range, which includes Vincci, Brands Outlet and Seed.It plans to open not more than 10 outlets in the local and Thailand markets to streamline cost allocation while maintaining the status quo for its Cambodia operations in FY2019. Padini has three outlets in Cambodia, seven in Thailand and just over 100 in Malaysia. In a Dec 7 note, Maybank IB Research, which has a “hold” call on the stock and a target price of RM4.05, tells clients that valuations “have become less expensive” following the recent share slide and signs of earnings recovery and improving same store sales growth would be re-rating catalysts. At the same time, it reckons that gross margins “are at risk of easing further due to price inflationary pressure from its suppliers as most textile articles (clothing) fall into the 10% SST bracket, which is more than the rescinded 6% GST”. If Padini can prove that it can grow its earnings faster than expected, the current rout would be just a blip on its otherwise stellar track record.